Take a short journey to adventure with Iron Kingdoms Excursions! Each volume in this series features three very brief tales about the people, creatures, and machines of Immoren. Explore the Iron Kingdoms and all the alliances, betrayals, and bloodshed of a war-torn continent for only pocket change. Discover how a mercenary contract does not necessarily die when your client does in “Honor in Death” by Josh Vogt. Stalk the gloom-haunted depths of the Thornwood Forest with a contingent of Kossite woodsmen in “The Ambush” by Richard Lee Byers. Learn the deeper meaning of glory and which deeds are truly worth remembering in “Record of Honor” by Orrin Grey. 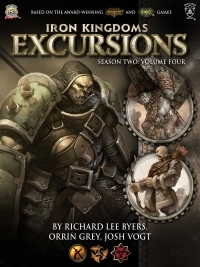 Get every volume in Season Two of Iron Kingdoms Excursions for only $4.99 with the Season Two Pass!